In what can only be seen as a sign of the times, Borders is closing its remaining 399 stores. Last ditch talks that would have brought in additional financing have failed, leaving the company with no choice but to liquidate. Borders' demise is without a doubt a result of the changing book landscape. There was some mismanagement as well, poor choices for store locations, etc., but much of this can be laid at the feet of eReaders and online shopping. Another blog posed the question of when was the last time you'd been inside a bookstore. I thought about it for some time, but had no idea. It's been that long for me. Before I bought my Kindle, I was already buying exclusively from Amazon. Now, even more so. One has to wonder if this isn't a tipping of the scales in the other direction. The "big box" retailers such as Home Depot, Wal Mart, Borders, Barnes & Noble, and others have long been responsible for driving many smaller retailers out of business. Yet here we are now with one of those same large retailers taking a swallow of the same medicine. The market changed, and Borders couldn't change with it. It will be interesting to see if the void Borders leaves behind is filled by smaller players, gobbled up by their main rival, B&N, or if it will just remain a void that people, over time, forget is even there as we push further into the electronic world. 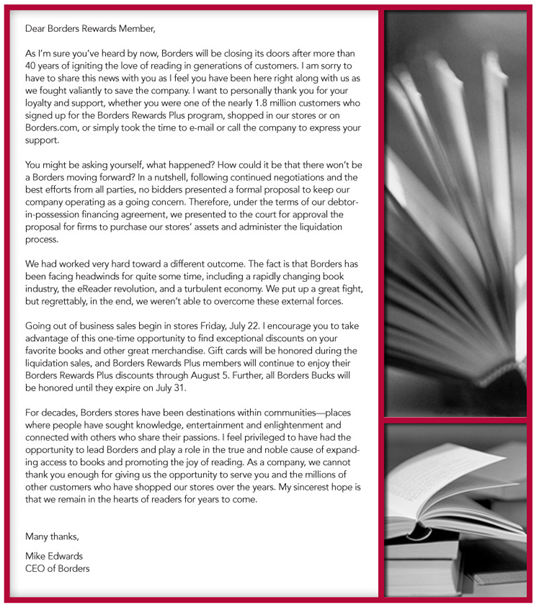 I'll leave you with the farewell letter sent by Borders to their Rewards Members. A look back at my writing life in 2011. The latest update on my writing progress and other writing goings-on.